A taxi driver is facing charges after a video that showed him crashing into a cyclist went viral last week. Thornhill resident Ali Farkhondehfall, 57, has been arrested and charged with dangerous operation of a motor vehicle and assault with a weapon. 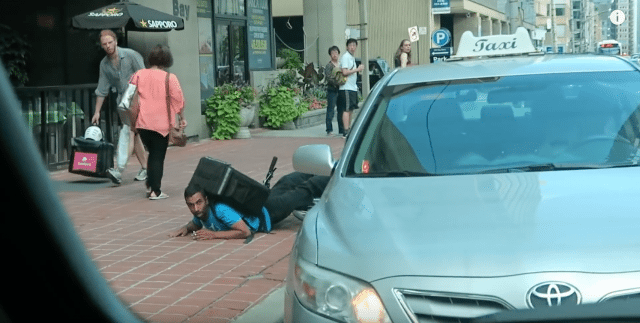 The video of the incident, which took place on Bay Street on August 18, accumulated more than three million views on popular YouTuber Roman Atwood’s channel. Toronto Police used the video to call on witnesses to aid the investigation. According to the police report, Farkhondehfall and the cyclist were involved in a physical altercation before the collision occurred. The 31-year-old victim, a courier for food delivery service Favour, suffered minor injuries. Farkhondehfall will appear in court on October 4.